The technology sector is progressing at the speed of light. Advancement in a particular technology is seen way too fast than ever before. The Internet is one of the essential sources to find any information in the blink of an eye. The sources that provide information on the internet are websites. Additionally, there are myriad of programming languages that are used for web development. Among multifarious programming languages available, it is difficult to select the best one for web development. Here, in this post, I will tell you the advantages of one such programming language, PHP and how it outshines other programming languages in various ways. One of the major advantages of the PHP programming language is that it is accessible for free to web developers. It is executed at the server side that means it functions on the web server. Because of the open-source feature, PHP developer can learn about the scripting code in easily through online platforms. Another advantage of PHP is that it is easy to use. Syntax involved in the PHP programming language is quite clear and reliable for developers. It also includes comprehensive documentation of varied functionality that is built-in with the core distributions. Furthermore, it considerably decreases the learning time for both beginners and competent PHP developers. This feature also makes this language well-liked the prototyping technique for developing web-related apps. Because of the effortless decoding of syntax, it is easy to alter the PHP codes. In other words, it is true that PHP web development tasks can be executed in very less time. This characteristic of PHP programming language helps the web developers to transform their websites into advanced apps. An open-source feature of this programming language helps the developers to incorporate new-fangled functions on a constant basis with minimal costing involved. The icing on the cake is that further maintenance in PHP codes can be carried out even by other developers, not necessary by the team which has completed the web development task. As PHP language is all the rage these days for web development, there are myriad resources available online as well as offline. The best part is that these resources are obtainable in wide varieties as well as without any charge. The PHP community is quite extensive and you will be able to acquire knowledge from different developers working with PHP language. Another reason why the PHP programming language happens to be the first-preference of web developers is that it is available for free. There are no such licensing fees involved for reaping the benefits of a programming language by web developers. The original source code of PHP programming language is available for free and circulated under General Public License. Additionally, the international community eventually helps in making advancements in its functioning. There are numerous PHP-based web solutions, of which, the practical usage is thoroughly tested and this is the reason why there is not much requirement of time and effort for improving the language functionality. PHP being a partly object-oriented programming language, codes can be used again for other website developing task. Usage of PHP scripting codes again; helps to save much time of developers. Additionally, developers have a wide-array of PHP frameworks to choose for web development, such as Laravel, WordPress, Symfony, etc. Every PHP framework provides different types of functioning features that makes the website developing work secured and speedy. This programming language has competent built-in characteristics that also make it effective for retrieving HTML. The flexibility of PHP language makes it sought-after programming language for the web developers around the globe. This, in turn, makes it a jaw-dropping hosting service provider. Any sort of unswerving web hosting service provider is efficiently compatible with the PHP programming language in their website host services. Generally, hosting packages include PHP language support with minimal costing that involves either free web host plans or affordable plans in just infinite resource requirement. In today’s fast-moving digitalized world, the loading speed of the website plays a very important role. In general, the attention of human is just 6-8 seconds but if the website fails to load within this time, a Google user is sure to switch to the next website. Because of quicker data processing functionality, PHP built website enables faster turnaround time for Google users. Originally, PHP web development came into existent for active web-pages that will be running of a long time. This is the reason why PHP scripts helps in resolving the web development issues much faster than any other programming language. Codes in PHP programming language can also be easily embedded in HTML and developers can transform present static website code into the dynamic without any hassle. It just requires incorporation of PHP code in the HTML. 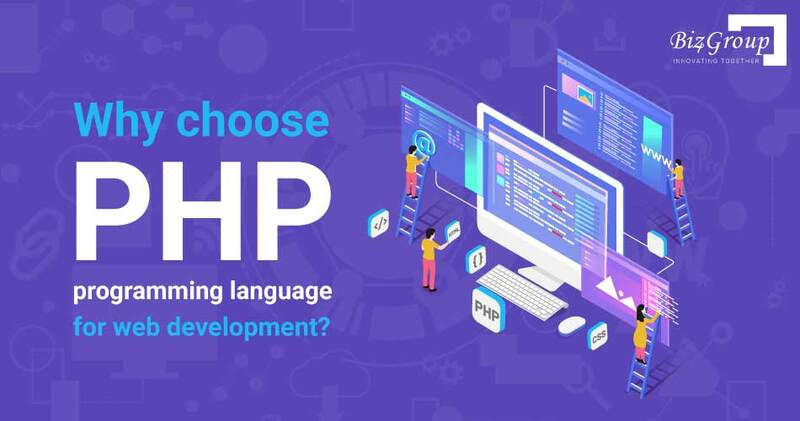 Such an outstanding feature makes PHP a highly admired language for developing elegant and function-rich websites that are compatible with HTML coding. Comparatively, the time taken for the development of websites using PHP language is much lesser than other programming languages. Even the complex software can be executed in the blink of an eye with a PHP programming language. This eventually means that decreased web development time leads to the saving of huge bucks on website creation. In a nutshell, it can be concluded that PHP is one of the competent programming languages for developing function-rich websites with the involvement of less cost and time of developers. So, are you all set to launch your business website to gain more visitors and customers? If yes, feel free to contact us, and we will assist you further.